So much yarn, so little time. : oh my - how could I leave it so long? I'm ashamed to see how long it's been. Never mind, now that I'm back...who'd like to help me win a competition? I'm touting for votes in the Folksy Angels competition. 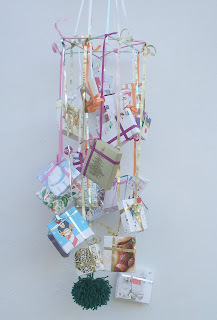 The brief was to make a decoration using recycled materials, I made a windchime from last year's used Christmas cards, a tangle of gift ribbon and a couple of straws and pipecleaners. and then post a comment telling me you've voted. 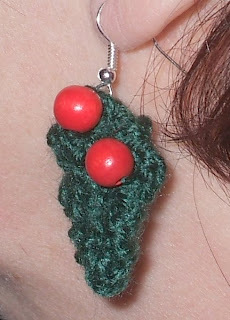 I will give a pair of my new holly earrings to 1 of you, randomly selected. If I win the competition - I will give each and every one of you who vote and leave a comment a discount coupon for one of my stores. :-) Don't forget to let me know how to find you. Whee! I voted, please enter me in the draw! I posted over there as "Ally" and used ten thousand exclamation points! LOL I hope there are some left, I might want to SHOUT! I just voted. That's a really cute idea! Please enter me for your drawing. Thanks!